One of the biggest obstacles to increasing contact lens use in the United Kingdom is comfort: people who are not comfortable in contact lenses simply will quit wearing them. Anyone who has had any irritation about the eye will instantly understand. Whether it’s allergies, or dry eye or something more troubling, when your eye is in discomfort there is no getting away from it. At Stanford, Dr. Saad Bhamia understands. He tried contacts as an undergrad and had to give them up as they were too irritating. Now, along with his colleagues, he’s trying to do something about it. The Stanford team’s theory was that discomfort starts with the breakup of the tear film during dewetting. The tear film is a wet coating on the surface of the eye and dewetting refers to the process that can occur at a solid-liquid or liquid-liquid interface. Basically, this is where things come together. When the tear film breaks down it leads to irritation. Dewetting also involves the lipid bilayer. This is a fundamental part of all cell membranes and gives the membrane some meaningful structure. It also is elastic and can stretch to support fluid beneath it. The surface layer also keeps the eye from drying out. So the challenge for the Stanford team was to design lenses that don’t disturb the tear film. They set about building a device named the “Interfacial Dewetting and Drainage Optical Platform” or I-DDrOP . The I-DDrOP was designed to mimic the surface of the human eye. Now the team can see how various things – temperature, humidity, various substances and how a sphere accommodates gravity – can affect eye comfort. 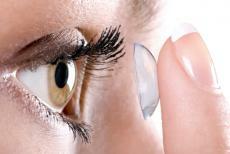 This is yet another example of how technology is being used to improve contact lenses. Millions of contact lens users and potential users across the UK can look forward to improvements in contact lens comfort thanks to efforts such as we see at Stanford.